What is the source to this saying? And is this saying by Imam Ali authentic? This is not a ḥadīth of Imām `Alī (عليه السلام), rather this is a saying of Sūfīs that has been attributed to Imām `Alī (عليه السلام). This saying is not found in our classical books of Islām, either Sunnī or Shī`ah. The next time that this phrase has been seen is by the extremist Sūfī, Ibn `Arabī (b.558/1164-d.638/1240), he is commonly known as Muḥyī al-Dīn Ibn `Arabī. 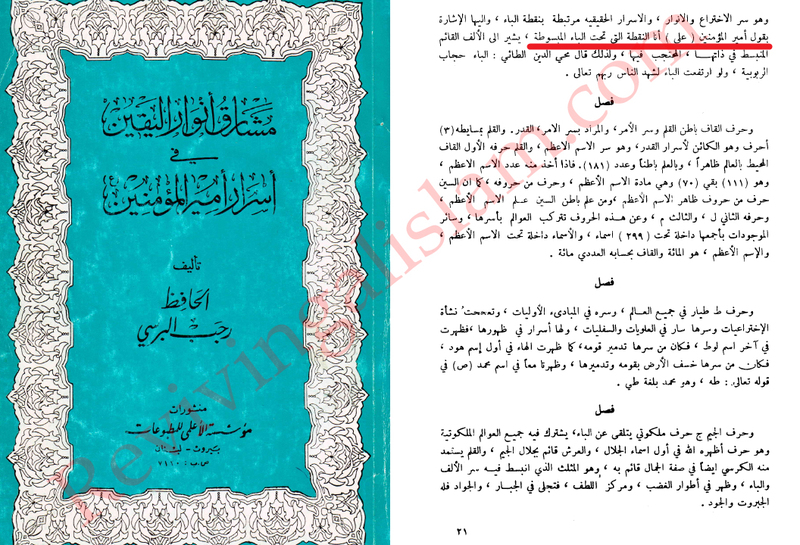 Ibn `Arabī in his al-Fatūḥāt al-Makiyyah, his magnum opus, has related the same story that al-Ghazālī has mentioned. The first time that this phrase has been attributed to Imām `Alī (عليه السلام), is by the Sūfī Sunnī scholar Muḥammad b. Talḥah al-Shāfi`ī’s (b. 582/1186-d.652/1254) book called al-Durr al-Mandham fī al-Surr al-A`dham. He does not give a chain of narrators of this saying, nor does he give a source to where he got this from. 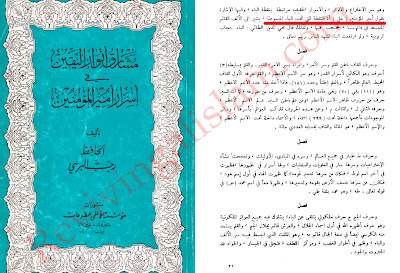 This book is still extant, and an old written manuscript of this book has been uploaded by Kind Saud University. 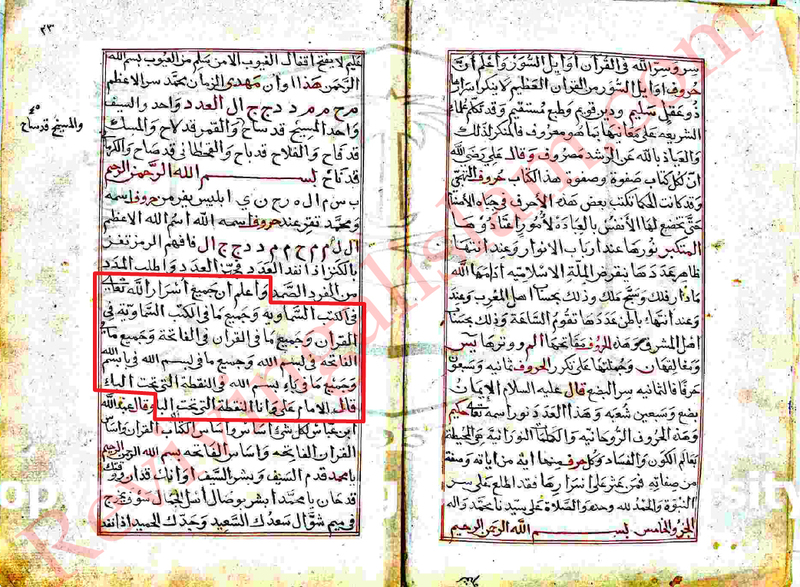 In this old manuscript of Ibn Ṭalḥah’s al-Durr al-Mandham, you can see the famous saying that is attributed to Imām `Alī (عليه السلام), “I am the dot which is under the bā’”. This is the first time in history that this phrase “I am the dot which is under the ba” has been attributed to Imām `Alī (عليه السلام). As you can see, he never gives the source or the chain of narrators to allow us to see how he got this phrase. This is not uncommon when reading through this book as he never gives the source or complete chain of narrators to the ḥadīth he mentions. The first Shī`ah source that mentions this phrase is from the Sūfī Shī`ah scholar Rajab al-Bursī (d. 813), who is also into the knowledge of the letters (`ilm al-Hurūf), in his Mashāriq al-Anwār. Rajab al-Bursī has been linked with the ghulāt (exaggerators). And al-Majlisī has said that he does not rely on what he puts in his book, unless it is in other authentic books. Since this phrase is not added in al-Majlisī’s Bihār al-Anwār, it is safe to assume that al-Majlisī thought that this phrase was da`īf (weak). al-Bursī does not also give a source, nor does he give a chain of narrators to this phrase. All the scholars that mention this phrase quote from either Ibn Ṭalḥah’s al-Durr al-Mandham or al-Bursī’s Mashāriq al-Anwār. For example, Sulaymān b. Ibrāhīm al-Qundūzī (d. 1294) quotes this phrase from al-Durr al-Mandham. Or, al-Sayyid al-Mar`ashī al-Najafī (d. 1411) quotes this phrase attributed to Imām `Alī (عليه السلام) from al-Durr al-Mandham. In conclusion, this phrase is fabricated and misattributed to Imām `Alī (عليه السلام). This is not so surprising, since Sūfīs have been known to attribute false things to our A’immah (عليهم السلام), especially Imām `Alī (عليه السلام). Abū Ḥāmid, Muḥammad b. Muḥammad b. Muḥammad b. Aḥmad al-Ghazālī (450/1058-505/1111), he is known as the mujaddid (reviver) of the 5th century. It is stated that he has authored about 457 books. al-Ghazālī most famous books, which he has authored during his Sūfī days, is Iḥyā’ `Ulūm al-Dīn (Rebirth of the Sciences of Religion). This could be a reference to the Sūfī Abū Bakr al-Shiblī (b. 247/861). It is stated that he adhered to the Sūfī way, but was of the Mālikī madhhab. Abū Sālim, Muḥammad b. Ṭalḥah b. Muḥammad b. al-Ḥasan, known as Kamāl al-Dīn, al-Shāfi`ī. He died in the city of Aleppo (Ḥalab) on the 27th of Rajab. 2) Therefore it is commonly known that they address people according to their level of understanding. 3) Since arabic letters had no diacritical marks in Imam 'Ali's (A) time - none would have understood this Khutba, hence it would have been obscure and purposeless and would have caused further enquiry. Exactly, but seeing the origin and analyzing it, helps us understand who is the originator of this phrase. Plus, it is hard to engage in an "isnad" topic, when the phrase doesn't have an isnad or source. Just a bunch of Sufis talking. I really enjoy and like the fact that you take the time to research thoroughly and answer the questions that others ask. Salaams & Greetings: Thank you very much for this well-researched information. I would say, however, that not everything comes down to sahih and dhaeef -- unfortunately there really is no consistent reliability in ilm al-rijal. We end up affirming what we want to affirm and leaving aside what we don't. We really need to inject the entire enterprise of analyzing isnad with a big shot of uncertainty. When it comes to Bursi, of whom I am a big fan, it is less important to consider sources and reliability and rather examine the philosophical system he is building. You can't isolate his (obviously apocryphal) statement of the Imam concerning the dot under the ba' -- it is part of a comprehensive way of looking at Imamate, and one that is more consistent with the ideas of the Imams themselves than that of the muqassareen and the bakri-appeasers. Since arabic letters had no diacritical marks in Imam 'Ali's (A) time - none would have understood this Khutba, hence it would have been obscure and purposeless and would have caused further enquiry. What about the Khutba of Imam Ali[as] in which he did not use any letter having a nuqta under it? 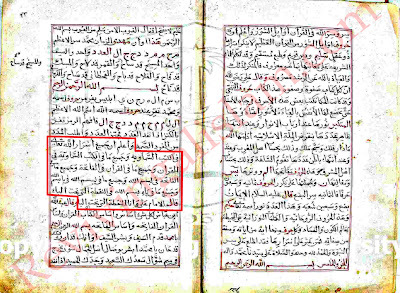 This invalidates your remark that the arabic letters had no diacritical marks in Imam Ali's[as] time. Did Sir Muhammed Iqbal have mentioned anywhere about it by referring Imam e Ali alysalam as First word of Quran (Bismillah). What is the relevance of Dr. Iqbal by referring Imam e Ali a.s. as first word of Quran. this is quoted by sunni Imam Qundozi Alhanfi and you are blaming shia shame on you man !!! !